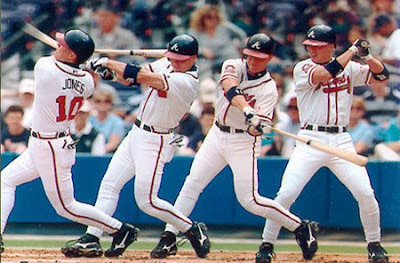 Chipper Jones is the epitome of a baseball player. He grew up loving and playing the game. He was taught the game by his Dad, who trained him to pinch hit because his Dad loved Mickey Mantle, perhaps the greatest power switch hitter of all time. He even has a great name to be an athlete: "Chipper". He still plays the game today with the same love and enthusiasm he played it with as a kid. He's a 'Player's Player". He knows how to play the game: he has baseball instincts. He came up as a shortstop, has played in the outfield in 'The Bigs', and of course is now an All-Star 3rd baseman. And he can hit. Oh can he hit! Did I mention he can hit? He will eventually hit and field his way into the Hall of Fame. But he will not hit .400 this season. I want him to. Badly. It would be a tremendous accomplishment for him as well as Major League Baseball. No one is more deserving of a .400 year. But it just isn't gonna happen. The MLB season is just too long to sustain that kind of consistency at that level. There are too many fresh relief arms coming at you game after game because starters don't have to work as deep into games anymore. The hot, humid, muggy days of July and August are tough on a ballplayer, and Chipper 'ain't as young as he used to be'. Chipper certainly is not known for his speed, so he isn't going to leg out many infield singles. But Chipper is consistent. He has a beautiful, natural swing. Being a switch hitter could be a plus simply because that doesn't give the pitcher an advantage, and he doesn't give up much when he goes right handed. Over his career he hasn't been known to go into long, prolonged slumps. So there are a lot of positives to figure into the equation. However, I just think it's to tough to pull off. But he's tough himself. Tough enough? I sure hope so. I would love to be wrong on this one! As Bobby Cox can be heard to yell from the dugout: "Come on Chip"!